Okay – as connected with the internet and lots of people as we are, we weren’t at all familiar with Ed Vizenor. Justin Stroh (our regular correspondent on all things New Evangelization) proposed Ed for the I faith vitamin: IGNITION. Wow! What a great interview. What a great guest. Thank you Justin. Well — even if we (at Catholic Vitamins) don’t know who Nacho, Victor and the author are, we certainly know about the movie – the wonderful, tender movie BELLA. And we now ‘know’ Ed Vizenor, thanks to his gift of the interview on this show. “INFLO”… is the purpose of this website. It’s a Latin word which means TO INSPIRE! For whatever reason you are visiting this website, in God’s plan, its not not by chance. In this short life all things under the sun are willed and permitted by Him for our good. So may your heart, in some big or small way, be inspired by something you find on this website. If you happen to be inspired here then please give all the Glory to Him. God doesn’t always choose the best instruments to make His beautiful music, to do His Eternal life changing work, in fact on the contrary, He often chooses the weakest so that His glory may shine through them and all will know it comes from Him. Thank you Ed for visiting our podcast. Thank you Ed for your witness. Thank you Justin for helping bring Ed Vizenor to our audience. If you’ve been with us for a while — we have featured reflections from our Irish friend, Fegal O’Neill. He’s a deacon candidate, now just a half year or so away from being ordained a deacon in the Catholic Church. 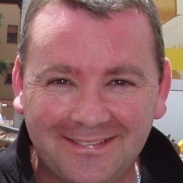 We are hoping to go visit Fergal and family and to be present when he is ordained to the diaconate. I might mention that there has only been one other class of deacons ordained in Ireland so this is still something new to the Emerald Isle. Fergal is from Naas in Ireland. It is a county town, and it is on the main road from Dublin to Cork, Limerick and Waterford. Naas is a cosmopolitan town of approximately 16,000 inhabitants. Naas is located 20 miles South of Ireland’s capital,and it is growing remarkably – the fastest growing town in Europe! The population of 14,000 is younger on average than other Irish towns (33% are between 24-44, and only 7% are over 64). The town’s 4,000 new arrivals in the last five years are Ireland’s Young Europeans: well educated and upwardly mobile home buyers, who share a technical culture as local hi-tech employees of Intel, Hewlett Packard, Donnelly Mirrors, and many others. The town is planning new housing estates in the next five years for a larger capacity of 22,000. I don’t mind you using my words.